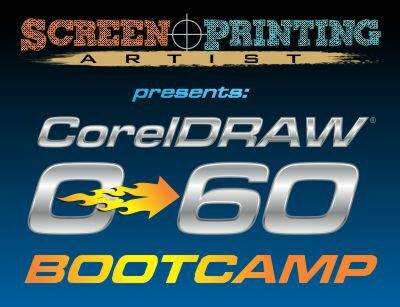 What is CorelDRAW 0-60 Bootcamp? The 0-60 Bootcamp is a clear, concise break down of what a beginner and intermediate CorelDRAW user needs to know to properly work with artwork that will be used to create screen printed designs on t-shirts & decorated apparel. This is NOT a software training class, it is a RESULTS class using software. The goal of the 0-60 Bootcamps is to teach SHORTCUTS that will get beginners and intermediate CorelDRAW users comfortable with the most important and useful tasks needed in screen printing. The SHORTCUTS are the fastest and most practical way to use the tools that are needed to get the jobs done without losing quality or creativity. We started with popular DVD style training and the most common requests were for more beginner and intermediate level walk-throughs of essential tasks that could be broken down into STEP-BY-STEP processes that could be experienced and practiced at an individual student's pace. With these Bootcamps the next level of interactive and paced out, STEP-BY-STEP training will be available to members with improved videos, practice artwork, and individual attention for questions and answers. Each class session will include a monitored and private Facebook group that will allow for discussion of tasks, jobs, and business questions that may be outside of the regular Bootcamp. The friends and associations that can be made from this private group can provide ongoing benefits to students long after they have completed the training. The 0-60 Bootcamp will be comprised of the following modules that will be provided in a scheduled format so that each student can work through the video and understand the stage of training before moving on. Intermediate users will be provided with additional training forks depending on their level for each step. NEW users of CorelDRAW are presented with a SHORTCUT to learn the basics that are needed to complete start up tasks. The five main art tasks are covered and practiced. Intermediate users are shown quick keys and advanced scripts for even faster processing of these tasks. SEPARATIONS are clearly introduced with the 4 main ways to prep, stage, and output designs depending on your device and/or service. For those of you that are new to screen printing, SEPARATIONS are how the art file is split apart into different colors that will become screens on your printing press for screen printing. Intermediate users will see how to work with higher level separations, bitmaps, editing, and more. SHORTCUTS in the set up, recreation, and art approval steps will be covered so that you will know what to do no matter how a client drops an art file on you. Everything from poor photos, screen grabs, to used napkins will be covered. How to get it in the computer, set it up, get the approval and deposit, and how to produce it for printing. TRACING bitmaps and line drawings so that they can be made into vectors for easy editing is covered. The top three fastest ways to recreate logos and complex drawings are clearly shown. Intermediate users will enjoy the ILLUSTRATION part of this training where you will see how to capture the style and illustrate drawings quickly. SPECIAL EFFECTS will be shown that are easy to create, replicate, and separate for screen printing. All SPECIAL EFFECTS that are shown in this training level will be styles that can be used for multiple applications and will create looks to type, graphics, and logos that are ideal in screen printed artwork. IMPORTING / EXPORTING files is defined and the most useful methods are covered in clear step-by-step methods. Intermediate users will be able to learn about creating custom templates and scripts for auto populating designs and approval guides. TRAPPING & IMAGE CORRECTION for separations and low quality bitmaps are covered with special emphasis on what are the simplest methods for each that maintain image and separation quality. Intermediate users will explore trapping alternatives and advanced halftone creations. FONT processes will be covered so that you will be able to find the fonts that you need, install fonts, and multiple methods of SHORTCUTS to make fonts less of a hassle when you need to get designs done quickly. Intermediate users will explore how to create your own fonts faster than ever. LOGOS that need to be developed, copied, and recreated / modified will be explored in this training. Intermediate users will see how to integrate looser, hand-drawn styles and distress overlays. BUSINESS CARDS & LAYOUTS are covered in the last training in the group. Clients will often ask for these, although they don't create direct money, they are a huge way to obtain loyal clients and customers that see you as a resource. Intermediate users can gain knowledge of how to produce custom cards, and integrate high-end graphics that can be sent out to printers. There will be ten training modules (shown above) that will teach NEW users the Basics, Separations, Shortcuts, Vector Tracing, Special Effects, Importing / Exporting, Trapping & Image Correction, Font Management, and Logo Development. Additional Bonus will be shown covering Business graphics in Cards and Layouts as well! What happens after Bootcamp ends? Each student will graduate the Bootcamp with their session art guide, practice files, and permanent access to the private Facebook group. Every student will have a premium seat for any new course or content. This Bootcamp is the result of over 20 years of industry work using CorelDRAW to produce and separate screenprinted apparel. The how-to information in this class are more than 4 industry seminars. Despite this, I wanted this class to be affordable so smaller shops could use CorelDRAW faster and get more out of it without spending a lot. The class is priced at $149 which is crazy for hours of training in proven methods just for screen printers! And if you sign up now you can use the code: ARTIST25 and take another $25 off! I started and right away on the first lesson I learned to be a lot faster. Overall, I feel I learned a lot of things I was missing in my knowledge of CorelDraw. Thank you! It was taking me a long time, but following how you were doing it was super helpful. It's nice to finally be learning how to use Corel!